When I was pregnant I read everything I could find about pregnancy. I needed to understand all the crazy things happening to my body, know what was going on with this tiny life inside of me and be prepared in the event any of my greatest fears came true. Like Chadwick's sign and hermaphrodites. I couldn't deal with actually preparing for a child until after he came. Since I'm all about being prepared for the important things, I asked my Facebook friends if they had any recommendations for good baby instruction manuals parenting books after Nathaniel was born. A bunch of people told me that I didn't need any books, I should just rely on my maternal instincts and the elders in my village for child rearing advice. "Thanks!" I typed, while rolling my eyes. Obviously I think it's important to consult with the "experts" in your life, but I think continued education - especially in the most important thing I will ever do - is pretty important as well. So thanks to all my fancy pants readin', I know that studies show that too much television watching can lead to ADHD, that "moving" naps (i.e. in the stroller) aren't as restful as proper crib naps and encourage bad sleeping habits and that playing with toxic chemical laden plastic toys can mess with the endocrine system and cause cancer. But you know what? Those "you don't need to read no stinkin' books" people had a point. Because the books don't account for your child's temperament. Or yours. Or your lifestyle. And that is why as soon as Nate wakes up (out of his stroller), we are going to watch some Sesame and then go outside and play with his plastic water table. Because they don't make any out of wood. ﻿Are you a hypocrite too? Today is my father's birthday. ﻿ I told Nate that Bubba's birthday was coming up over a week ago. I am not exaggerating when I tell you that Nate has mentioned it ("BUBBA BIRDAY COMIN' UP!") every single day since I told him. It's rare that I actually purchase cards and get them out on time. You wouldn't believe the amount of cards I buy that never make it to the intended recipients. If anyone needs a free sympathy card, just swing by my house. But Nate's daily reminders insured that I actually managed to put get my dad's car in the mail on time. Small victories. This is take two. Take one has Nate yelling, "SURPRISE" but then not saying much of anything else. ﻿Nate also insisted (every.single.day.) that we needed to send Bubba a truck for his birthday. The color changed depending on his mood. I did not manage to get my act together enough to make this happen. That will have to be a belated gift. But, Dad, I think you should totally wait a few years and cash in on the birthday truck when Nate is a major league pitcher. It will be a lot nicer than the toy store version he can afford now. Just saying. I love you, Dad! Have a very happy birthday. Thanks for being part of our small, but very loyal, Nater Tot fan base. We can't wait to see you in August. One of the challenging aspects of parenthood﻿ - for me at least - has been dealing with the fact that babies change so quickly. Eating preferences, sleep habits, favorite games - just when you think you have it all down and you're feeling kind of smug (like you actually might know what you're doing), they go and change on you. So I love when that aspect works to my advantage and we discover that Nate all of a sudden enjoys something that used to make him screech in disgust. The latest example: FINGER PAINT! When he was nineteen months, we tried it and it was a complete disaster. I don't know what made me give it another go this week, but I'm so glad I did. Oh, I think he finished his dinner early and I desperately needed to clean some dishes rather than chase him all around our still not quite baby proofed home. He completely took to it this time and has been requesting PAINTS! every night after dinner. Even messier than ice cream, but well worth the effort. The only problem? They smell all gross and toxic to me. I've tried making my own, but it wasn't pretty. I want an all natural non-toxic paint like Eco Kids Natural Plant Dye Finger Paint , but the one review I read was on the negative side when it came to the staying power of the color. Then again, I don't know that I really care about what it looks like when it dries. We only have so much room on our fridge, so guess where most of Nate's masterpieces end up. SHHHH, don't tell him! Do your kids like finger paint? Any natural brands to recommend? Luckily for us, Nate has never had too many problems in the diaper rash department. (I just got an image of poor Natey reading these entries as a teenager. At least I have enough self control to omit the naked sitting-on-the-potty shots. That should count for something.) But I always like to put a coating of cream on him for bedtime to protect sensitive parts during the long overnight stretch. I used Balmex regularly until I realized that the ingredients include several chemicals of concern. Environmental Working Group gives Balmex diaper cream a "5" (which is a moderate hazard rating). They list endocrine disruption, neurotoxicity and organ system toxicity among their concerns. Although I'm better than I used to be (just a tiny bit), I'm still no expert at reading labels (who has time for that?! ), so I'm going to trust them on this one. I then switched to Episencial Nurturing Balm because I love their Episencial Sunny Sunscreen. 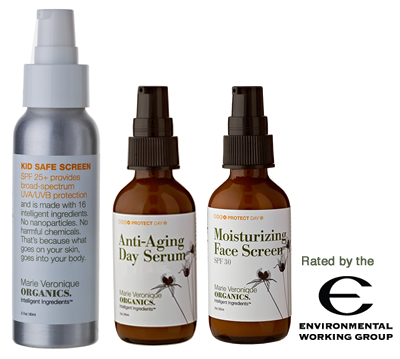 The sunscreen scores well on EWG and does a great job protecting our skin from the sun. I naively assumed that their whole line was non-toxic. Unfortunately, I just looked up the EWG rating and that cream also ranks in the moderate hazard category with a "4." Our local big box baby store started carrying it and I was so happy to have found a relatively inexpensive, safe cream that I didn't have to order online. I'm so disappointed. I've used Earth Mama Angel Baby Angel Baby Bottom Balm in the past and really liked it. I'm going to switch back now that Episencial's tainted for me. Like all EMAB products, the Baby Bottom Balm gets the highest non-toxicity score available on EWG's Skin Deep (a Zero). It smells pretty herbalicious (okay, I know that's a stupid word, but it's better than "herby") and works well too. My only complaints are that the jar is on the small side and I have to order it online. Apparently some Targets have started selling EMAB products, but ﻿none around me. Boo. Look, ma - no diaper rash! ﻿ Do you have a favorite diaper cream? What's it's rating on EWG's Skin Deep? Just like his Daddy, Nate has been a Mets fan for just about his entire life. He knows Jose Reyes (JOSE!) by sight and a hearty chant of GO METS! (along with a fist pump) is literally part of his bedtime routine. With the brainwashing going on around here, there is no chance that this child will love the Yankees like his mother's side of the family. Nate got his first taste of Citi Field yesterday. He was a bit overwhelmed with the massive amount of people, sights and sounds.﻿ Especially since he napped in the car on the way over and he usually requires two hours to "wake up" from a one hour nap. He lasted much longer than we anticipated and we were able to stay about two hours. It took a bit of work to entertain him - lot of walks around the stadium, junk food (ice cream in a helmet and his first sno cone) and attempts by our good friends to distract him. Nate didn't get to see JOSE! play, but he did see Mr. Met walking around the park, so it was totally worth the effort. Have you taken your kids to any major sporting events? I guess it's true... if you don't use it, you really do lose it. I find it interesting that Nate used to sign some ASL signs - like PLAY - more accurately at 16 months, when we were actively signing, than he does now at 23 months. And then there are other signs - like TURTLE - that he was never able to manage when he was younger because they require both hands and some intricate movements. He likes signing TURTLE now just for fun. The whole head wiggling thing provides hours - okay, seconds - of entertainment. PLAY: Form a "Y" with both hands (think "hang ten dude") and twist. Click here for a video demonstration - by an adult. TOYS: Form a "T" (thumb between pointer and middle finger) with both hands and twist. Click here for a video. TURTLE: Make a fist with your thumb on the top. Curve your other hand over the base of your thumb. Wiggle exposed thumb - like it's the head of a turtle poking out of a shell. Click here to see what I mean. When it's raining outside - or way too hot - it's a good time to bring out the pipe cleaners (or "fuzzy sticks" as they are apparently now called). Nate practiced his hand-eye coordination the other day by threading cheerios onto pipe cleaners. And threading pipe cleaners through the holes in an upside-down colander. Then he practiced making a mess by throwing the pipe cleaners everywhere. They definitely kept him busy for awhile. The pipe cleaners do have pointy ends, so be sure to leave your tot unsupervised ﻿for hours while they play. You know, right after they run around the house eating carrot sticks and holding those scissors. If fuzzy sticks are too wild and dangerous for you, you could use uncooked spaghetti too. Or string. I'm sure you could figure something out. 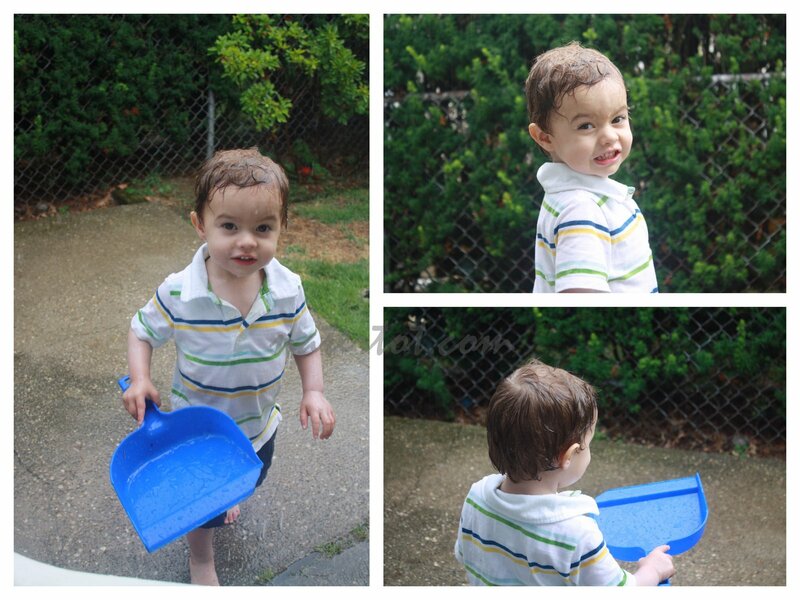 Another option is going outside to "SEE RAIN, MOMMY" followed by "TOUCH IT, MOMMY." Then before you know it, they are sopping wet, catching rain with a broken dust pan and a huge grin on their face. Oh, and the soggiest diaper you've ever seen. What do your kids do when it's raining outside?